Over the years I have had the opportunity to meet hundreds of interesting people. Jack McClure, was one of the coolest guys I ever met. 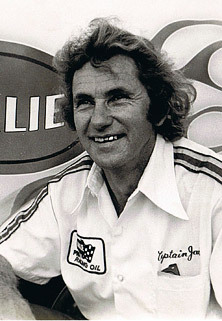 I first met Captain Jack McClure back in about 1972 at the Great Lakes Dragways. My old friend Bob Metzler, the track promoter, introduced Captain Jack to me. Captain Jack was one of the good old southern boys that you took a liking to the second you met him. The big thing that got my attention and the crowds attention, was that the one and only Captain Jack would jump into a Rocket Powered Go Kart and drive it over 225 mph in the quarter mile. Everyone said this guy was either crazy or he had a death wish. Jack was neither of them, Jack was an entertainer. 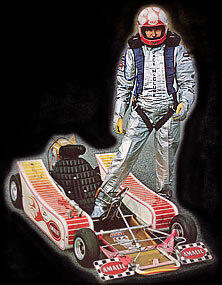 I will never forget the time when Jack made a personal appearance with his Rocket Powered Go Kart at Orange County Raceway in California, over 30 of the fastest Funny Cars, and Top Fuel cars were there, as you mite expect Jack stole the show by posting the low E.T. of the meet, Jack is now a young 85 years old. I have volunteered to put this website up for Jack, so Captain Jack McClure’s record braking history will never be forgotten.